The Atari 2600, originally called the Atari VCS, is the godfather of modern videogame systems, and helped spawn a multi-billion dollar industry. 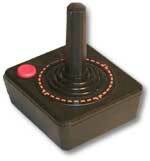 Atari sold over thirty million of the consoles, and together with other companies sold hundreds of millions of games. Cartridges for the system were produced across three decades, and there are still new games being produced today. But it almost didn't happen. In the early 1970s, video arcade games gained commercial success for the first time. The American public was introduced to Pong, Tank, and other interactive video games which populated amusement parks, bars, and arcades. The games were successful enough to create interest for home versions, so in 1975 Atari released Home Pong and it was a smash hit. Other companies such as Magnavox and Coleco followed suit and released their own dedicated console games. Then in 1976, Fairchild Camera and Instrument introduced the Channel F system, the first cartridge based home video game system. The industry recognized that cartridge systems were the future of video gaming, and began development in that direction. In January 1977, RCA released the Studio II, another cartridge based system, although it only projected in black and white and seemed to be focused on educational titles. Then, on September 11, 1977, the Atari VCS (Video Computer System), with an initial offering of nine games, was made available at both Macy's and Sears. This system, later renamed the Atari 2600, would come to dominate the industry for many years. Because of oversupply, the Christmas season of 1977 was very rough on the video game industry, and the Atari 2600 was the only system that managed to emerge unscathed. Atari enjoyed strong sales in 1978 and a fantastic holiday season, as Atari released more games such as Outlaw, Space War, and Breakout. Internally however, Atari was at odds. Nolan Bushnell, the inventor of pong and founder of Atari, wound up leaving the company and purchased Pizza Time Theater, which later became the successful Chuck E. Cheese! In 1979 Atari continued their trend and released 12 more games which met with continued success. However, Atari was now facing some stiffer competition from the Mattel Intellivision and the Magnavox Odyssey2. Atari needed a mega-hit in 1980 in order to squash the competition, and they found it in the home version of a game from Japan called Space Invaders. It was so popular that people were buying the Atari 2600 just so they could play Space Invaders at home - the first videogame 'killer-app'. Following that, Atari released Adventure, which was the first video game to contain an Easter Egg - placing an object in a certain area revealed the programmers name, Warren Robinett. 1980 was important for another reason - the creation of the first ever third party software producer, Activision. The company was formed by four Atari employees who were unsatisfied with the working conditions at the company. They released four games initially: Dragster, Fishing Derby, Checkers and Boxing. The games were very well received by the public, and revealed that the Atari 2600 was capable of better games than Atari themselves had been producing. Atari tried to prevent Activision from selling games, but they failed and Activision grossed $70 million that year. By 1981, the video game industry was basically a horse race between the 2600 and the Intellivision. While the Intellivision was technologically superior in some respects, the 2600 continued to lead in sales. Atari released the home version of Asteroids, which was a huge success. Inspired by the success of Activision, another software development group called Imagic was formed. They would not release any games until 1982 however. Another company, Games by Apollo, was formed in Texas and released several titles that year. Coleco entered the market in 1982 with the release of the graphically superior Colecovision. 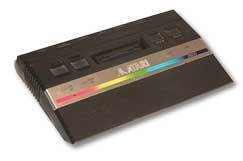 To combat this new system, Atari produced the 5200, a technologically comparable system. The 2600 dropped $100 in price in order to remain competitive. Then a company called Arcadia released a peripheral called the Supercharger which played games in an audio cassette medium. This allowed for multiple loads and expanded the 2600s capabilities. Atari released Pac-Man and E.T. that year, two incredibly hyped games which were critical flops. Although Pac-Man sold many copies, it was considered to be a poor translation of the arcade hit. However, there were many fantastic games produced for the 2600 during this period, and it was still selling strong. For the Atari 2600, 1984 was a much more subdued year and the price of the system had now dropped to $40-$50. Many were saying that the video game industry was dead. However, Atari surprised everyone by announcing the release of the 7800, and also promising more 2600 games with improved graphics and sound. Unfortunately, neither of these things happened in 1984 because Atari sold their home video game division to Jack Tramiel who believed that home computers would replace video game systems. No further mention of the 2600 or 7800 was made that year, and it appeared that those systems might be dead. 1985 was another very quiet year for Atari and video games in general, although a few games were released for the 2600 by third party companies. Activision produced Cosmic Commuter and Ghostbusters, but with little fanfare or marketing, these games did not sell well. However, because of the huge game library and cheap price, Atari still sold over a million 2600 consoles in 1985. There were very few plans for home video game systems by any company in 1986, since the market appeared to be dead. Then, to most peoples surprise, Nintendo brought the NES to America and it was a smash hit, proving that video games still had a place in the US. Atari decided that maybe it would be a good idea to release the 7800 units it had in storage, and produce some more 2600 games. Initially, the 7800 was released with only 3 games available, although it was compatible with the entire 2600 library. They also redesigned the 2600 as the 2600 Jr., a machine with the same abilities, but a new look and marketing campaign. It was sold for less than $50. Video games were once again selling phenomenally in 1987. Atari released several new titles, including Jr. Pac-Man, and also licensed a number of games from other companies such as Donkey Kong and Q*Bert. These new titles sold for $10-$15. Interestingly, a number of titles began appearing again from third party companies such as Epyx, Froggo, and Exus. It seemed that the 2600 was not dead yet! In 1988, Atari rehired Nolan Bushnell and announced a number of new titles, including Secret Quest, a game written by Steve DeFrisco but sold under Nolan's name in the hope of increasing sales. Atari continued to manufacture these games until 1989. However, it was apparent that the 2600, a decade after its introduction, was finally at the end of its run. Although it was still produced and marketed outside of the US, the Atari 2600 finished its run in America. No other console has had such a long history or sold as many systems in the U.S.
Today, the 2600 still has a large number of fans who remember the countless games played over the years, and the years to come. There are even games being produced today by hobbyists, often in cartridge format with a full color label and an accompanying manual. Finally, the recent trend in retrogaming has introduced many more video game fans to the 2600, and it continues to live on 24 years after its release!